UC San Diego was all blue and gold on Saturday, April 14th for the campus’s annual Triton Day— a day devoted to helping admitted undergraduate students figure out if UC San Diego is the right university for them. 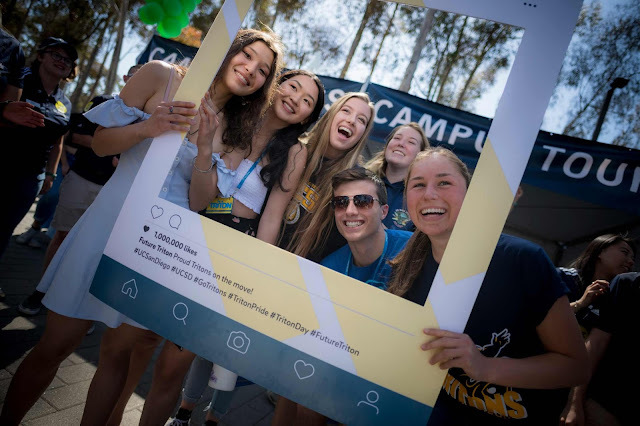 This year, a record breaking 97,670 first-year students applied to UC San Diego, and more than 25,000 of those admitted showed up on Saturday to scope out their potential new home. The IDEA Engineering Student Center, which provides engineering students with academic support and social engagement to foster an inclusive and welcoming community, offered several programs to help admitted students get a taste of life at the Jacobs School of Engineering and learn about the various academic and extracurricular programs available to them. A record 124 admitted students participated in an Engineering Overnight Program, where they were paired up with a current Jacobs School student to see what a day-in-the-life is like. Students staying in the Engineering Overnight Program were treated to a breakfast hosted by Albert P. Pisano, dean of the Jacobs School of Engineering. Participants were also able to tour labs, talk to different faculty, and learn more about student life on campus, including student organizations and resources to help students succeed at college. The admitted students slept overnight in an engineering student’s residence hall to get a feel for living on campus. Other activities included a trivia night, faculty panel and an engineering organization fair. Students at the IDEA Engineering Student Center table. In addition to the IDEA Center programs, all six of the Jacobs School of Engineering departments were in full swing on Saturday, with fully staffed tables to share information about their respective majors to declared and undeclared students. Global Teams in Engineering Service (TIES), a humanitarian engineering project program, also had students and staff on hand to highlight its classes and projects for students to join. Engineering organizations such as Engineers Without Borders (EWB), Biomedical Engineering Society (BMES) and the Institute for Electronic and Electrical Engineers (IEEE) met accepted students as well. BMES demonstrated its “Build A Brain” project, developed by its outreach committee for the San Diego Festival for Science and Engineering, and talked to students interested in bioengineering about research opportunities on campus and the variety of ways students can be involved in the bioengineering community. IEEE invited students to learn about its different student-led project teams, such as MicroMouse and Grand PrIEEE, and some of its technical workshops, such as making Valentine Hearts using programmed, blinking LED hearts. The Electrical and Computer Engineering (ECE) Department showed off several student projects from ECE classes. Students talked about their ECE 188 (LabVIEW Programming: Design and Applications) projects, which all centered around making elevators using the LabVIEW interface. After tabling finished, the demos moved to Jacobs Hall. There, more projects such as an interactive laser pinball machine, made by students in ECE 115 (Rapid Prototyping) and an autonomous motor vehicle, were on display. Triton Day. Photo courtesy of IDEA Center. The Structural Engineering Department hosted its own open house for interested students at the Structural and Materials Engineering building. 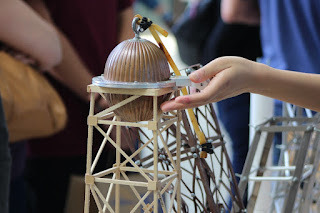 Not only did students hear from Structural Engineering Department Vice Chair Hyonny Kim about structural engineering classes, but they also engaged with graduate students who showed off various demos, like a short-range project launcher and structures made from wood sticks. 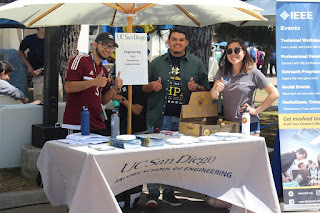 Organizations like Tau Beta Pi (TBP), the Society for Civil and Structural Engineers (SCSE), and Society for Asian Scientists and Engineers (SASE) talked to students about their clubs’ activities. HackXX, a women-centric hackathon run by UC San Diego students, held its inaugural project creation and development sprint in 2017. The second edition of the hackathon didn't disappoint: more than 100 undergraduate students spent 24 consecutive hours the weekend of April 7 honing their web development, computer-aided design, 3D printing, machine learning and virtual reality skills at HackXX. The hackathon, open to undergraduate students from any academic background, gender and sexual identity, aims to provide a space where all innovators feel welcome. In addition to workshops and time for teams to develop and build a project of their own, HackXX also featured remarks from Jayashree Atre, former senior director of product development at Intuit; an Acing your Phone Interview session hosted by Northrop Grumman; and a Deep Dive into Machine Learning forum held by Cisco. After 24 hours, all the projects were judged by two panels: a group of engineers from Northrop Grumman awarded three prizes for the Best Communications Projects, and the second panel of judges awarded best beginner and best overall project awards. Kathy Herring Hayashi, the IEEE Women Engineering Region Coordinator for the Western United States and an engineer at Qualcomm, was a general judge, along with Nisha Yerunkar, president of the UC San Diego VR Club. The Grand Prize-winning team—Any-A— walked away with a BeatsX, BB8 Droid, Echo Spot, a Samsung Gear VR as well as an Echo Dot for each winning participant. Any-A is a Java application that helps elementary school students practice basic math problems with a random math generator. The team’s goal was to empower girls in elementary school by helping them solve math problems and giving them early exposure to female role models in math in the form of an “Encouragement” feature where users receive encouragement from famous female mathematicians. Northrop Grumman awarded their $500 first place gift card to team InfoPuppies, which created a website containing a centralized database for dog microchip information. Aside from apps and websites, there were a variety of virtual and augmented reality projects, software development endeavors and even a blockchain project, all created in less than 24 hours.